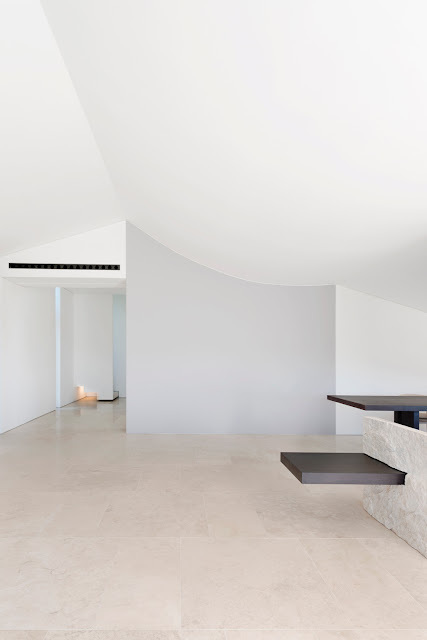 Located in Rome, Italy, Penthouse II by architect Alessandro De Sanctis of des interior architecture is designed as a minimalist fluid space with lake views to calm the spirit. 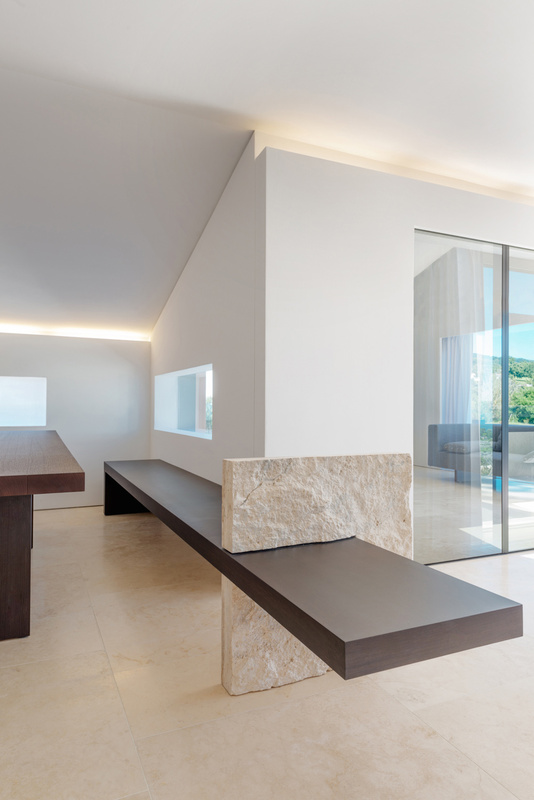 Alessandro De Sanctis - des interior architecture designs a lake view duplex penthouse interior as a fluid space to calm the spirit. 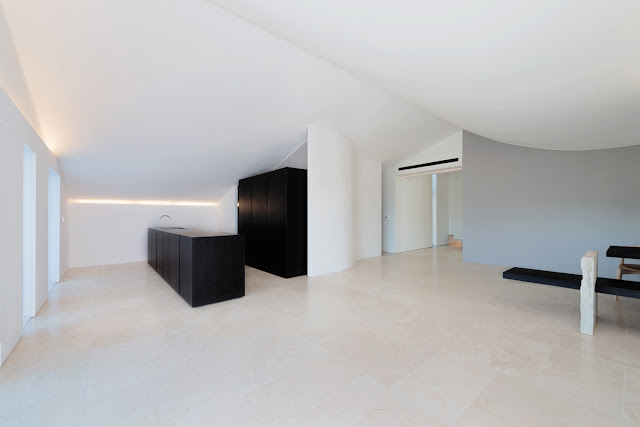 The PENTHOUSE II project consists in a interior design of a lake view apartment located on the top floor of a new gable roof building. 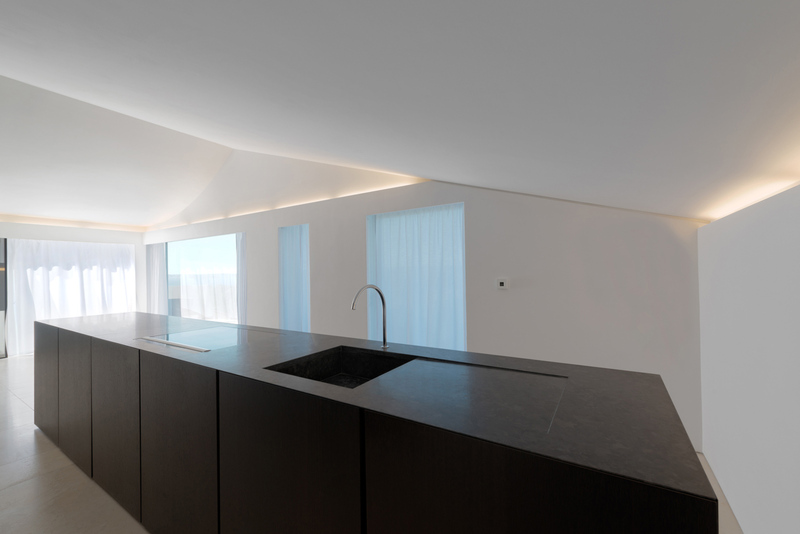 By accessing the apartment directly from the elevator you can see a high vertical window from which you can glimpse the iron staircase leading to the flat roof. The living area is open plan and is characterized by the Roman Navona travertine floor, the wall and the roof curved accompanying the eye of the observer toward the large windows that allow access to the terrace. The parabolic shape of the ceiling like a sail down was inspired not only by the waves of the lake during the mistral but also the architectural works of the Neo-Expressionist masters architects. 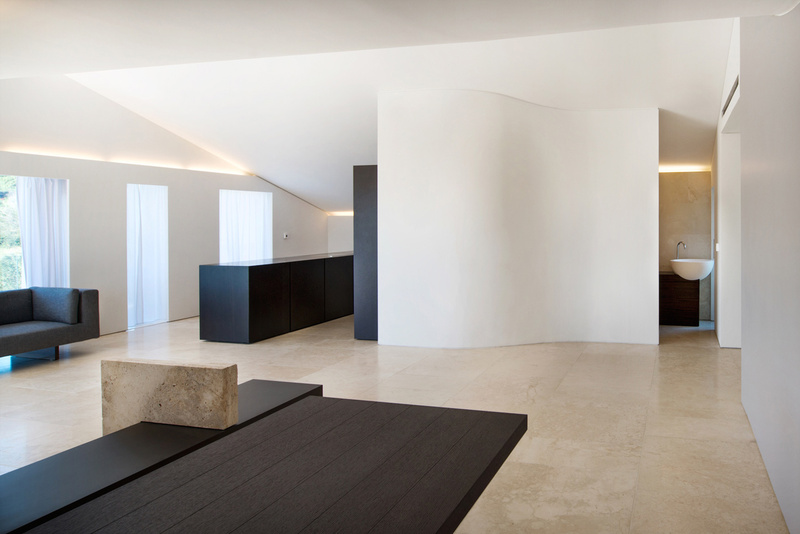 This is not a mere exercise in style but a solution to the problem of acoustics for the existing gable roof and the choice to make the fluid space; this effect is accentuated by the sinuous curved wall which hides the bathroom for guests, the only room separate from the living area, where he glimpsed the massive hemispherical sink. The long dining table and the chairs are international brand products, while the custom-made bench is characterized by a travertine split face leg; The TV is hidden by a glass reflex that allows the expansion and interpenetration of inner and outer space; The kitchen includes an island with a dark granite top characterized by 45° angles while the closet adjoining is characterized by recessed doors. 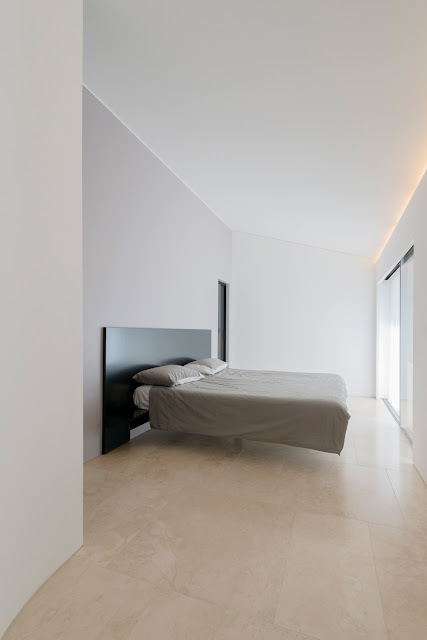 the sleeping area, consisting of three bedrooms and two bathrooms, is located at a higher level and is divided from the living area by a travertine split face massive wall. 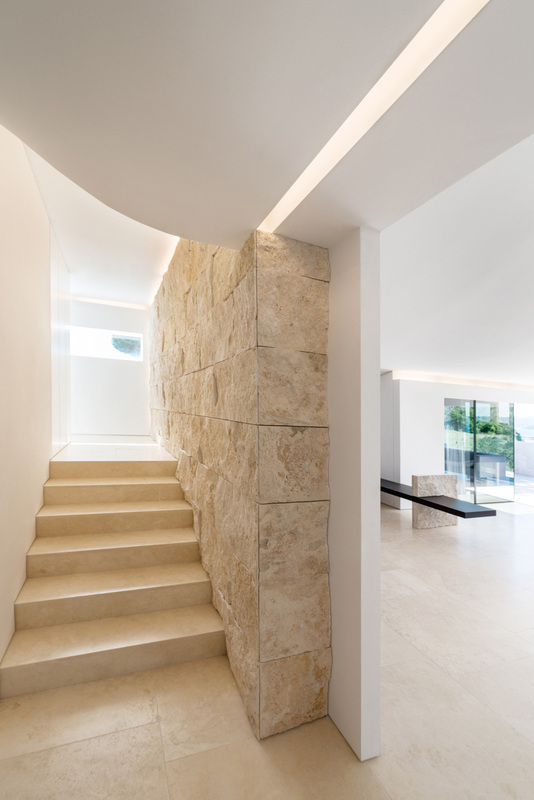 It is accessed through a corridor illuminated by a long panoramic glass window. 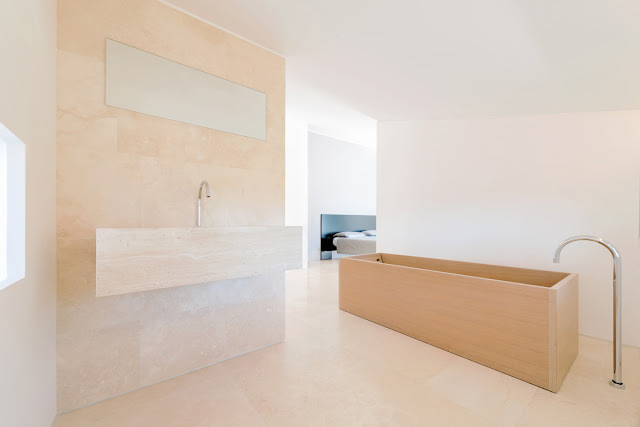 The master suite features a open space bathroom consisting of a wooden bathtub and a custom made washbasin is carved from a single block of travertine marble Navona. 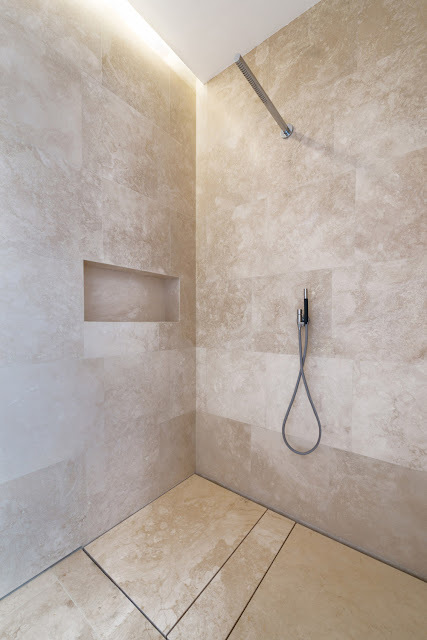 The shower room which is located behind the master bedroom is lined with Roman Navona travertine and is separated from the wc who are in another fund always behind the bed. 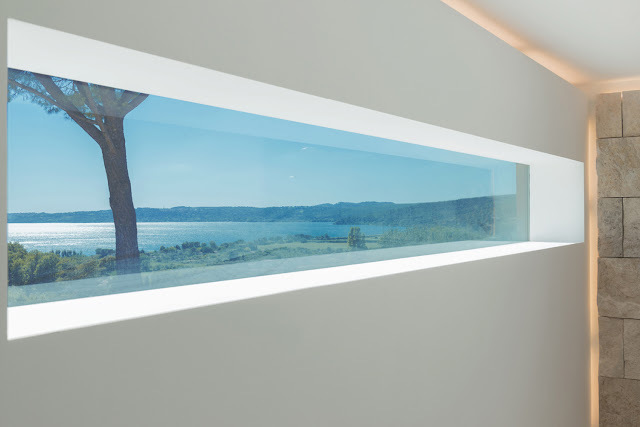 The walk-in closet is enclosed by a curved wall while a sliding stand hides the TV by using a reflex glass. 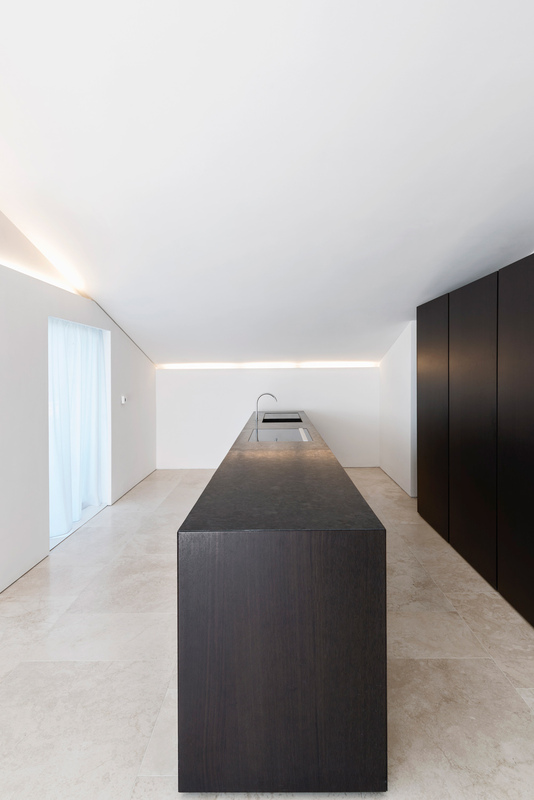 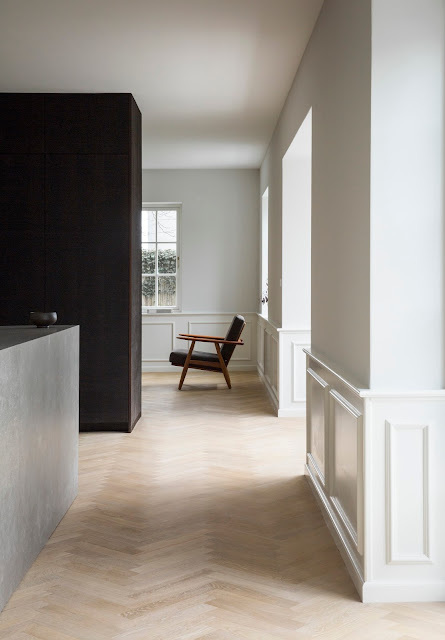 All lighting in the house is made exclusively by luminous grooves that produces a suggestive indirect light. The switch plates are a prototype designed by alessandro de sanctis.